We understand that entering a hospital can be confusing and overwhelming for patients and loved ones. Patient care is our most important job. Our staff is committed to providing outstanding and compassionate care to each and every one of our patients. We are also sensitive and responsive to the issues facing patients’ families and support network. We want to make sure your experience at SCBHS is as pleasant as possible and that your questions are answered. The child is accompanied by an adult visitor at all times. The child is not ill. The child is wearing shoes at all times. Nursing staff can limit the number of visitors and duration of the visit in the best interest of the patient. Our chapel is located near the visitor entrance. It is nondenominational and is open 24/7 to patients and visitors. If you wish to see your spiritual advisor, you or a family member should notify them about your loved one’s hospitalization. Our patient registration desk is located close to the main entrance. If you are registering someone, please have their current insurance information with you at the time you register. Information desk personnel will work with you to answer any questions or concerns you might have. If they can’t help you they will put you in contact with a staff member who can answer your questions or attend to your needs. No one is denied access to services due to inability to pay. Financial information is available to patients regarding their stay. Your family member may ask his or her nurse to set up an appointment with an SCBHS financial advisor. A financial advisor can help with an application for state-supported insurance, Affordable Care Insurance or recommend other options to help them, such as a discounted/sliding fee schedule. Patient meals are served at 7:30 a.m., 11:30 a.m. and 5:00 p.m. You can check with the nurses’ desk about having a visitor meal brought to your patient’s room or you can go to the dining area for a meal. Our dietitian and kitchen staff prepare meals for patients according to the patient doctor’s orders. Relay patient food preferences or substitutes to the Dietary Supervisor or your nursing staff. Please bring your patient’s insurance policy identification and numbers with you when they are admitted. If the information is not available at that time, please call or send it to the billing office as soon as possible. We will bill their insurance carrier as a courtesy provided we are given the necessary information. If their insurance company requires prior authorization, please let us know so we can contact their insurance company for you. We accept credit card payments. At admission, patients receive a copy of the Patients’ Bill of Rights. Please read this document carefully. If you would like a copy or have any questions or concerns, contact the Health Information Services Department. Each patient room has a telephone. Dial 9 to get an outside line. All local calls are free. Patients and visitors with cell phones can use them in the room for local and long distance calls. If using the room phone, long distance calls must be charged to a phone card or made as a “collect” call. If you need assistance, dial “0” and ask for help. Phones are also located in the front lobby and hallway. 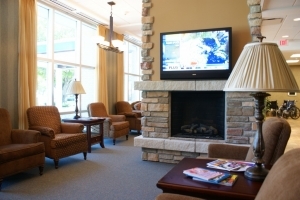 Four waiting areas are located throughout the hospital. They are available to visitors, family members and patients. Make yourself comfortable in these areas. You can use cell phones in the waiting rooms and bring in snacks while you wait. First time to Swift County-Benson Health Services? Click below to see our location on Google Maps. Visitor parking is located directly across the street.